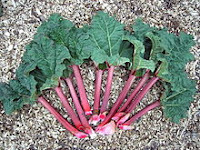 Rhubarb (herbaceous perennial plants growing from short, thick rhizomes) is a group of plants that belong to the genus Rheum in the family Polygonaceae. They have large leaves that are somewhat triangular shaped with long fleshy petioles and small flowers. While the leaves are toxic, the plants have medicinal uses, but most commonly the plant's stalks (see picture, source : Wikipedia) are cooked and used in pies and other foods for their tart flavour. A number of varieties have been domesticated for human consumption, most of which are recognised as Rheum x hybridum by the Royal Horticultural Society. Rhubarb (stem & roots) has been used as a strong laxative (the two - anthraquinones emodin and rhein are responsible). Rubarb has been used in traditional Chinese medicine & medieval Arabic and European prescriptions. The rhizomes ('roots') contain stilbene compounds (including rhaponticin) which seem to lower blood glucose levels in diabetic mice. Now, researchers from Biomedical Research Center at Sheffield Hallam University, lead by Dr. Nikki Jordan-Mahy, have come up with new findings. Researchers found that baking British garden rhubarb for 20 minutes dramatically boosted levels of anti-cancer chemicals called polyphenols. Previous research has shown that polyphenols selectively kill or prevent the growth of cancer cells. This is the first study to examine the benefits of British rhubarb, specifically a variety grown in South Yorkshire. Earlier research has studied Oriental medicinal rhubarb, which has been used in traditional Chinese medicine for thousands of years. Baking and slow stewing offered the best maintenance of colour through preservation of anthocyanin and the highest antioxidant capacity. Baking for 20 min provided well-cooked rhubarb with the highest antioxidant capacity and the highest anthocyanin content, which is important for the aesthetic quality of the dish.